The 1917 Suite spans two issues of Blackbird. 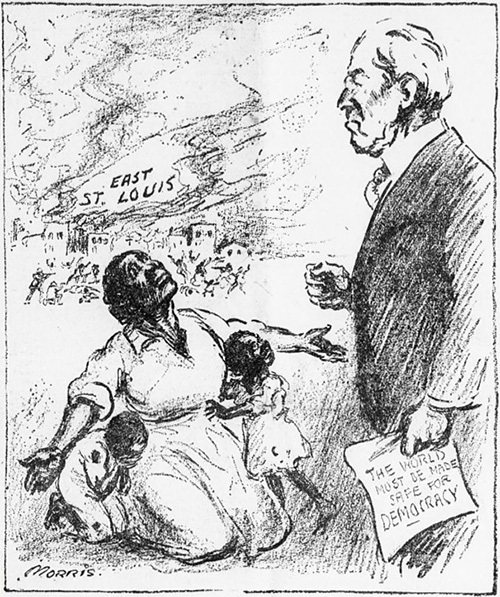 In the opening editorial of the September 1917 issue of The Masses, activist and journalist John Reed argues that August of that same year was “the blackest month for freeman our generation has known,” a phrase that opens and closes his commentary. 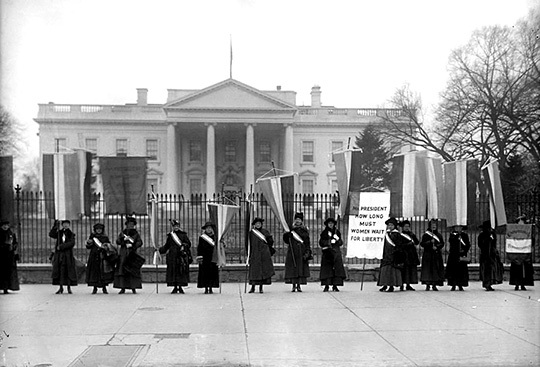 Suffragists protesting in front of the White House, 1917. Hopes must constantly be rekindled, and only those who live can rekindle them. The only stuff that can retain the life-giving heat is the stuff of living hearts. And the hopes of mankind cannot be kept alive by words merely, by constitutions and doctrines of right and codes of liberty. The object of democracy is to transmute these into the life and action of society, the self-denial and self-sacrifice of heroic men and women willing to make their lives an embodiment of right and service and enlightened purpose. The commands of democracy are as imperative as its privileges and opportunities are wide and generous. Its compulsion is upon us. Ironically, Wilson’s language describes the role of those men and women who will come to stand in protest of his own administration, the injustices and outrageous behavior of their local and federal governments. History clearly documents the violence, often ignored or endorsed by leadership, freely carried out against American citizens.